ketosis – The 100 pound weightloss diet journey! Day 184 – October 4th, 2017 Enjoying a lunchtime smoothie!!! Good morning!! Well I haven’t had one, not even ONE heart palpitation since I quit the keto diet on Saturday. I know not every diet works for everyone but when it involves my heart you wanna bet I’m not fooling around! Onward bound. I am sitting here sipping on my second smoothie for today….happy and feeling good! I have incorporated better sweetening options into my smoothies as opposed to before where I thought I was using better sugar replacements but little did I know they still affected my blood sugar to spike. Not all sugar replacements are created equal. When you go looking for a sugarless sweetener in my opinion stevia is the best. Not everyone likes the taste of stevia but it doesn’t cause a blood sugar spike as long as it’s not mixed with something else. Great Value sells a powered stevia but it’s not solely stevia..it’s mixed with maltodextrin. I never knew the difference. Maltodextrin is high on the GI ratings therefore it does cause your blood sugar to spike. Be very careful of what you use to sweeten any of your foods and drinks, forever learning. I love learning the more I learn the better choices I can make. I may not make all the right choices all the time but little changes can affect your health in a very positive way! Go ahead and Share this! I am beyond frustrated with all the different diets out there and everyone thinks their diet is the right one. I went off keto for 2 weeks and sadly went back to my normal bad eating habits. During that time I didn’t have any heart palpitations, at all. Last Monday I started back doing a low carb diet but decided I needed fiber and more vegetables than just the occasional keto option so, I ate around 50 carbs a day. It’s still considered to be low but just not keto. Anyways, Wednesday I started to feel little palpitations and shrugged it off. Thursday came and I felt them again, and again Friday and yep you better believe it again today! I said that’s it! I am not doing any kind of diet that puts my electrolytes out of balance like this. I’ve never had heart issues and it just seems like it’s surrounded around doing this keto/low carb diet. I’m done with this. I’m sitting here looking at my food diary and I just realized my potassium for most of the week was like this picture above, extremely low. You know the funny thing is ….my smoothie diet had way more fiber and potassium!! The only thing I really need to change on my smoothie diet is the sugar. Guess I’m going to have to get praying about this because I have to lose this weight and ever since I stopped the smoothie diet I’ve been looming around at the same stinkin weight. 2 months almost! Pray for me please!! I need to know and learn how to eat healthy. I want all my vitamins and minerals to come from real food. I was told on Keto and Low carb that people need to supplement with magnesium, potassium, and fiber. In addition to the supplements you need to salt everything!!!!! There’s got to be a better way!!! I think I may just go back to smoothies. I am considering drinking 2 a day, with a balanced meal. If you have any suggestions at all, please chip in. I would be forever grateful. Hugs to all who read this. So I was so tired of the heart palpitations and not going to the bathroom so much so, that I threw my hands up in the air and temporarily gave up. Something tells me that if you’re heart is not functioning properly you must stop and listen. I did order some magnesium supplements because from what I’ve read alot of people are deficient in it and I assume I’m probably one of them. I haven’t felt any heart palpitations since Friday!! I can’t give up on trying to lose weight. I won’t give up. Let me tell you though this has got to be one of my biggest mountains in life. I want to be skinny, but not just skinny I want to be healthy. I don’t want to be a rake though, no offense to any skinny ones out there LOL, I just want to keep some curves. Anyways, I keep reading everything I can find on the keto diet, the paleo diet and low carb. I believe that getting rid of unnecessary carbs like all the ‘white’ ones is a step in the right direction. It’s known that these cause inflammation and a spike in your blood sugar levels. Apart from that I’m really not sure how to be healthy!! There are so many fad diets out there and everyone thinks they’re right…the problem is everyone is different and your body reacts in it’s own way, to the foods you eat. One diet doesn’t fit all but surely there is one way to eat that is the most well-rounded. I know for a fact that I am going to minimize sugar intake and limit carb intake. I don’t think I want to stay in ketosis. The heart thing got to me and I’m to old to be messing around with my heart. Also, they really don’t have a lot of vegetables and the high fat did work to keep me full but what kind of diet has you getting all of your nutrition from fat? 70-80% of your calories are to come from fat!! Think about that for a minute. I’m not sold on it. It does make you full but I quickly learnt that I was depleted in sodium, potassium and magnesium. I’m sure I was missing out on vitamins too. I also need to make sure fiber is up there on my list as my mother had colon cancer. I need to make sure everything is moving in that department as well. Keto diet is very low in fiber contrary to what they may say. I asked in a group about fiber and most of them are taking supplements. I am all for supplements but try and get what you need from whole foods, doesn’t that just make sense? I’m praying about how to precede. I just want to be healthy and consistently see the weight come off. I also know that I must get active. It’s not a want but a need. I am happy I tried keto, because you don’t know if something is going to work or not until you try it! Last night I sat down to welcome back an old friend of mine…my night time smoothie. It was AWESOME! What’s not to like about being able to have ice cream every night. No, it’s not ice cream but let me tell you it sure does taste like it! I can even switch up the flavours by adding in these stevia drops I found on Amazon. I used caramel last night and I have other ones like chocolate, coconut and vanilla. MMMMMM. Can’t wait for tonight LOL. I will make this part of my calories and save my one fruit for the night. I am counting calories to make sure I’m not overeating and trying to just keep the carbs low for now until I figure out what I’m going to do. If you have any info or comments please do so!!!! I welcome constructive criticism and of course anything else you want to say! Day 159 – Sept 9, 2017 I’m backkkkkk! Ok, so I told ya’ll I was done with blogging but unbeknownst to me, I missed it! So here I am to update you on my goal to get healthy and lose some weight. I am 247lbs. I gained 3 lbs and have been eating a strict keto diet. Which required me eating under 20 carbs a day. I started getting heart palpitations a few days ago or maybe it was a week ago. I never knew you could have electrolyte deficiencies but I do now. I ordered some magnesium supplements and I’m thinking about getting some potassium. I already drink a chicken broth and just add extra salt to that so I think I’m ok in that department. My husband suggested I add “no salt” to some water and sip that back all morning to restore my much depleted potassium “tank”. I just can’t do it. I added it to my scrambled eggs the other day and it took everything in me just to eat it. It was gross. It was salty and ruined my eggs. I am frustrated by this whole eating healthy thing. It’s so much easier just to eat what tastes good and I have extra storage for heat in the winter so I don’t see what the big problem is. Hahahahaha. Ok, that’s not the truth. Truth is I have to get this weight off. I miss my smoothie diet, which works for me…but I have no since learned that it was high in sugars. I don’t want to have a diet high in sugars and the feeling of being full on a liquid diet as opposed to a high fat “keto” diet is definitely different. I have to find something that is going to work for me and my family. I won’t stop until I do. I’m maintaining the weightloss from my smoothies but I have to find my lifestyle diet. I want to be able to have an occasional treat or if I want a banana, man I should be able to eat a stinkin banana!! There’s an update. It’s just nice to get this off my chest. I’ll blog as often as I can but this you can bet on, I’ll be back. I miss it, miss ya’ll and miss writing. Day 143 – August 24, 2017 Back in keto and lost a pound! Yay!! After 3 days I finally got back into ketosis! I checked last night and was happy to see the kitostix change colors! Then I stepped on the scale to see I dropped one pound! How on earth does that happen when you’re eating bacon, eggs, cheese and caesar dressing?!!! I’m one happy camper. I’m glad that I’m never hungry. I only eat when I’m hungry and am surprised that my calories intake is usually around 1500. I don’t count every day but I have basically the same thing at breakfast as lunch the only variable is my dinner. I don’t have a need to snack at night because I’m stuffed from dinner, bonus! I now weigh 247lbs! 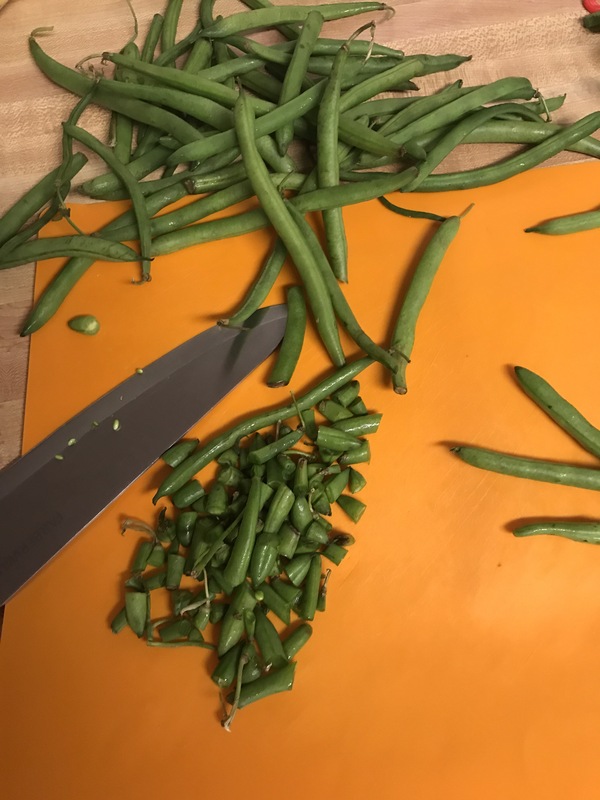 Is there an easier way to cutting up beans and prepping them cause this has to be one of the most annoying veges to get ready to eat LOL. Day 142 – August 23, 2017 not in keto yet! Last night I used one of the ketostix to see if I entered ketosis since Sunday and it clearly read that I had not. I’m not sure how long it takes to get back into ketosis but I’m hoping by Friday I will be. One good thing is I haven’t gained anymore weight I am remaining steadfast at 248lbs. I have to get to the gym too. I bought some weights for at home to just get some arm workouts in it’s just making the time to do it. My husband’s work schedule is all over the place and I’m a creature of habit. I like to do the same things at the same time and if that doesn’t happen I get thrown off. What does it matter about my husband’s work schedule, you ask? Well, I drive him and pick him up because we only have one vehicle. That’s why. He works overtime alot lately so I never really know when he’ll be done it’s within a 3 hour span usually. I’m sure you can imagine what that’s like! Hoping I can get this figured out. The picture up above was last night’s dinner a recipe I got off of diet doctor’s website. I am shocked at how many good recipes they have on that site! Everyone loved the meatballs and surprisingly it was very satiating! Tonight I’m going to just keep it simple and fast. Have a great day guys! Day 141 – August 22, 2017 KFC chicken is not good for you but it sure does taste good! Got ya!!! It’s not KFC, nope not at all. It’s a really good recipe that I found on Diet Doctor’s website. The batter is sour cream, jamaican jerk seasoning, salt, pork rinds and coconut flakes! My husband said it was so good that he preferred it over any other fried chicken he’s had!! Yes, it was that good. I don’t know who came up with the recipe but it is well worth the time that it takes to make it. I haven’t lost anything I’m still at 248lbs. Hoping things will start going again. Day 140 – August 21, 2017 Buffet, oh oh. So last night we broke. We went to a buffet that we hadn’t been to in a very long time. I gained 2 pounds but I’m right back at it today. I read that doing a re-feed for carbs is a good thing but I’m not sure if that’s true or not. All I know is I messed up. I can’t give up though and I will continue on. I just saw this girl in a FB keto group who posted pics of her progress on this diet and they were amazing! She weighed 300+ and dropped 19 lbs in a week. That’s alot of weight!! I am liking the recipes and do believe I can stick to it. I am having issues with going to the bathroom so I will need to take a fiber supplement of some sort. The only time I went to the bathroom every day was on my smoothie diet. It’s crazy because I’m not sure why there is such a difference. Maybe it’s because on the smoothie diet I had alot of fruit? My protein was very high on that diet too but higher carbs then fat. Now things have switched I have a very high diet in fat, moderate amount of protein and very little carbs. It’s amazing to me how your body reacts to the different macros. I’m still learning. Day 138 – August 19, 2017 Caesar Salad?!! Probably my most fav food in the world has to be a caesar salad and you know what?! On this diet it’s actually allowed!!! Ok, all but the croutons are allowed. We had burgers without buns and caesar salad for dinner last night. It was great! Today I stepped on the scale and unbelievably to me, I lost another pound! I am now weighing 246lbs. Almost back down to where I left off before I came off my smoothie diet. Part of me thinks that an overly high diet in fat can’t possibly be good, despite all the articles I’ve read. My husband and I were talking about it this morning. He said the most important thing is to keep the carbs low. He’s not a fan of having a high diet in fat so apart from what I make for dinner he’s having a more balanced protein to fat ratio. I’m going to give it a go for another week and see how my stomach is and how the bathroom stuff goes LOL. I need to do something that I will be able to stick to long term. If it were just about eating this would be fine because you eat when you’re hungry and don’t need to count calories! We shall see what happens though. Day 137 – August 18, 2017 Down a pound! Yay! I lost a pound, not sure how with all the food I’ve been eating, especially the high fat but it’s true! I now weigh 247lbs. I haven’t been feeling to hot the last few days though. I was light headed and had a bit of a headache. I probably don’t drink enough water, that’s a given but I’m not sure if that’s why or if it was something else. I am going to continue on and see how it all works out in the end.